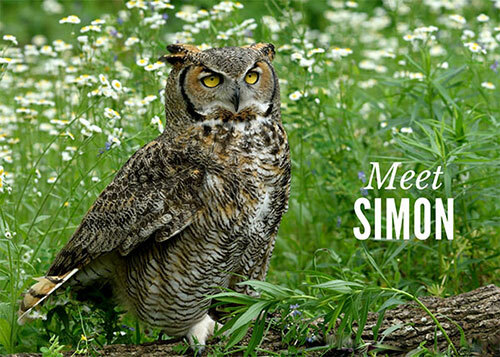 Meet Simon, a 3 year old owl from Wyoming. Although Simon was originally thought to be male, it became clear when she arrived in Houston that she is a large female Great Horned Owl. Simon was also rescued off the side of a highway by Suzanne Hansen, a volunteer with Pilots and Paws. It was determined that Simon had been on the side of the road for at least 24 hours with a broken leg and a broken wing. Suzanne named Simon after a very special rescue dog of hers that had recently passed away from an incurable disease. Suzanne and her husband rescue and transport animals in their airplane, Simon’s Flight, in memory of their dog. They are so dedicated that when they can’t fly, they drive. Simon the owl was their first raptor rescue, and they drove 10 hours round-trip over the Big Horns to bring her to Ironside Bird Rescue for rehabilitation. This is where Tskili and Simon’s stories first intersect as, coincidentally, Ironside is the same place Tskili stayed decades previously while awaiting his trip to Texas. Simon’s surgery was successful in repairing her leg and her wing, but as the wing is slightly crooked, she cannot fly well enough to be released. Thus began Simon’s career as an educator with Houston Audubon. Stay tuned next Tuesday for the story of Tskili’s recent illness and how Simon was vital in his survival. If you’d like to help Houston Audubon’s conservation efforts, including taking care of our feathered friends like Tskili and Simon, please contribute for #GivingTuesday on or before Nov. 27th by clicking here.